I am constantly amazed and humbled at the great lessons that I am taught from my own children, and this day - over five years ago - was no different. We had recently discovered that we were expecting baby #4. We were obviously very excited, but at the same time, the sinful and selfish thoughts seemed to creep into my mind. The ages of our other children at that time were 5, 2 , and 11 months. So, it was easy to think "Lord how can I do this?" and "I'm not doing so great with these three! How can I take care of another baby?!" All of these thoughts totally focus on myself, instead of The Creator of life. Not to mention the world's view, which flooded me with the the thoughts that having four children is insane! Learn for one thing that God thinks about boys and girls and notices what they do. He does not only tell us about the men and women of Jerusalem. He makes mention of the "boys and girls." He tells us it will be a good time when there are MANY of them, and that it will be a good time when they play in the streets. Some folks do not care to see children, and say that there are too many of them in the world. These folks are not like God. 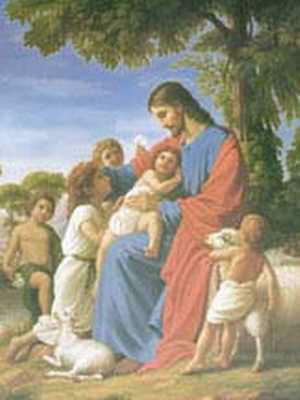 The great God in Heaven loves children. He knows that there will be no men and women by and by if there are no children now. He says in Psalm 127:4 and 5, 'Like arrows in the hand of a warrior are the children of one's youth. Blessed is the man who fills his quiver with them.' Folks who do not like boys and girls, and are cross with them, ought to remember that they were once children themselves. There is much about children in the Bible. Read the histories of Ishmael, Isaac, Benjamin, Moses, Samuel, and Abijah. Read the Proverbs of Solomon and see how often that wise man spoke of children. Read the Gospels and see how Jesus Christ noticed little infants and took them in His arms and blessed them. Read the epistles of the Apostle Paul and see how he speaks of children. These things were written for our learning. Dear children, remember all this and do not forget it. You are never too young or too little for God to take notice of you. You are never too young or too little to begin thinking of God. Are you old enough to be naughty? Then be sure that you are old enough to be good. Are you old enough to talk? Then be sure that you are old enough to say your prayers. Are you old enough to learn bad words? Then be sure that you are old enough to learn [Bible] texts. Are you old enough to know and love your mother? Then be sure that you are old enough to know and love Jesus who died to save your souls. Boys and girls, remember this first great lesson: God takes notice of you. Mind that you take notice of God. What a great lesson and reminder to me of the awesome blessing that children are, and the joy that is seen in watching them play. The Lord is constantly refining me by giving me days that I am utterly dependant on Him, but, He is using us as parents to do the great work of bringing them up "in the discipline and instruction of the Lord." I can confidently rejoice in His filling of my quiver, because I know that the more that I am loving these children, the more I am becoming like Him. This is the means by which He is working in my heart. I need the children's sermons more often!